If you are looking for a registered business entity in the US state of Virginia, then you are at the right place. Here we provide you a detailed guideline for assisting you in your search. For conducting the search, you need to have the business or corporate entity name or the business identification number handy. Below is a step by step guidelines on how to use the Virginia business search tool. 1. The first step is to access the Virginia business search page by clicking here. The search page looks similar to the screenshot below. 2. The business search form allows you to search by either the entity name or SCC ID. You can also specify how to use the search, either by keyword, starts with or contains. For this example we will be searching by name. 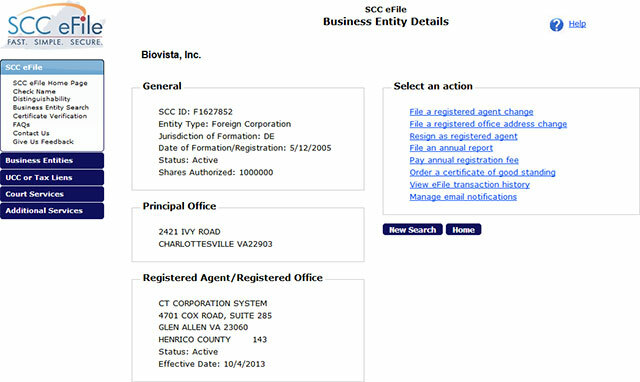 Go ahead and type "Biovista" in the "Enter Business Entity Name or SCC ID" field. Also select the "keyword" option and then click the "Search" button as shown in the screenshot below. 3. Once you click the "Search" button, it will display a list of results that match your search criteria. It shows the SCC ID, the entity name, type and status for each business entity found. To view the details of a business, click the entities name as shown in the screenshot below. 4. When you click the entity name to view the details for that business, it will bring you to a page that shows the companies general information, office location, the registered agent as well as additional actions such as filing annual reports, order a certificate of good standing etc. You can see the details page in the screenshot below. 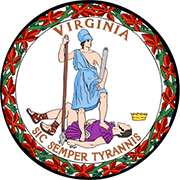 The Virginia Secretary of State is an elected constitutional office of the US state of Virginia. Like in the state of Massachusetts and Pennsylvania, the Secretary of State of Virginia is also known as the Secretary of the Commonwealth. The current office holder of the Virginia Secretary of State is Levar Stoney. He also assists the Governor in the appointment of individuals in the board for serving the Commonwealth. The Secretary of State of Virginia is the keeper of the Seal of the State and is the custodian of the public documents and the archives of the public. The Secretary of the State is also responsible for the issuance of licenses and authorizations to the business entities in the state. The Secretary of State of Virginia also registers lobbyists and is also in charge of authorizing public documents.